This October was one of the craziest months I’ve had all year, and, honest to God, I have no idea of the why or the how of it. All the kids’ activities kicked in at once, as well as my own, my mom was supposed to arrive, then didn’t, then reset the date, and then changed her plans again, then finally arrived, which kept me in stand-by mode for two weeks, not being able to make any plans as she was arriving “any minute now” and then kept me busy for the two weeks she was actually here. In fact, now that I think about it, it all makes sense, October was taken over by the tornado that represents my mother’s visits. A visit, which incidentally, was much better than expected, in part because I kept my expectations way low and in part because I sent the kids off to their other grandma for three days. My mom has a low tolerance for children and I always had unrealistic expectations as to her magically (and inexplicably) becoming a kid person as a grandmother. She does really well the first few days, then she usually overloads, but this time we got to spend some quality mother/daughter time for a few days and then the kids came back. Though I felt bad sending them away since they only get to see her once or twice a year, I’m perfectly aware that it’s all in my head. They didn’t care, their other grandma was ecstatic, my mom got to decompress, and I got to go shopping all day, cook with my mom, and go out to dinner with absolutely no organizing required and no guilt at leaving the kids home with the babysitter. Definitely the way to go for all her visits, until the kids start into the tween/teen years, at which point I will be able to just leave her to it and go enjoy myself in total independence. The Husband’s health saga continues, he’s not terribly ill, he’s just not terribly healthy either, and quite frankly, it’s starting to get annoying for all concerned (directly, or indirectly). He’s actually starting on a path of self-discovery of sorts, which hopefully will bring him some positive results and, even more hopefully, won’t drive a wedge between us, as these things often do. Things between us, they have been tense lately, so we’re all hoping that some good will come of this, and I’ll leave it at that, for now. We went out for lunch today, a rare occurrence on a week day, which, in this case, mostly involved taking the cars to get the tires changed for winter… oh so romantic, I know. As chance would have it though, we decided to go to a friend’s restaurant that we always enjoy greatly and is usually too far to drive to in the rare evenings we manage to dine out sans kids what with the babysitter waiting at home impatiently counting the minutes till she can leave and go out with her own boyfriend. This restaurant, The Baluardo, is fantastic, the chef Marc Lanteri is French and his wife, my friend Amy, is American and their diversity really shines through, with the Italian wholesome ingredients, the American boldness and French sophistication. If you’re ever in the area it’s definitely an obligatory stop, especially if you’re into Michelin Guide starred restaurants. They had French Onion Soup on the menu today. I’ve been hankering after a good, authentic, French onion soup, which is strangely a much harder dish to find than one would think. 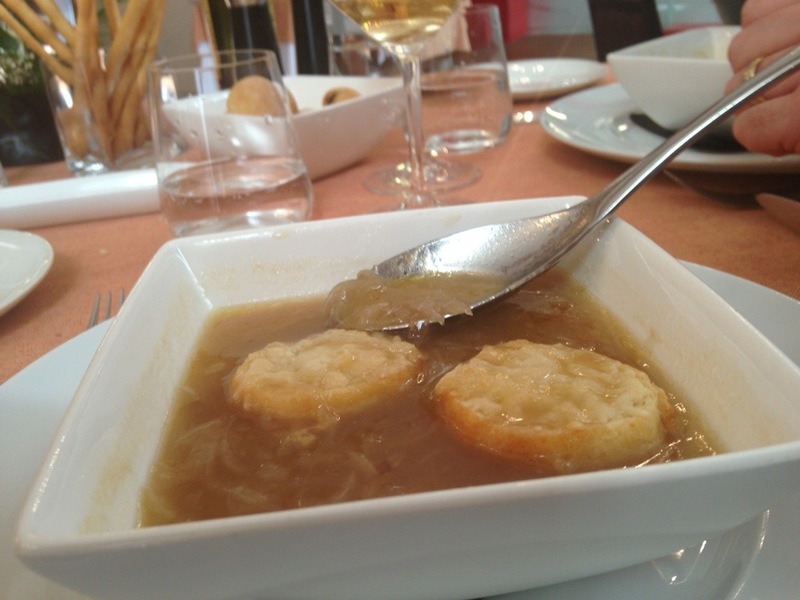 Also, I’m extraordinarily picky when it comes to French Onion Soup. Mostly I only like the one I make, which is truly delicious, and for which I can take none of the merit other than being able to follow a recipe. If you want to try your hand at it I got the recipe from Deb of The Smitten Kitchen, since finding it I’ve tweaked it enough to make it my own, but the original is the best place to start experimenting. After eating it today, I wrote on facebook that French Onion Soup makes me happy. And it really, truly, does. It’s so simple, just a handful of ingredients, but it’s so comforting when done right, so light yet tasty, it has so much depth of taste and texture. I needed it today, I needed something simple to make me happy, I needed to be reminded that life doesn’t always have to be about the complicated dishes, that sometimes the simple things, if prepared with great care and attention – because that’s the only way to get a French Onion Soup to taste right – can be just the thing to set your world back right-side up. If only for a few minutes.